Original dark red morocco over oak boards, stamped and gilt. Made for presentation to Charles VIII of France by Franciscus Pamoleus of Genoa; L. Donini Regimontani D. Medici (1633? ; inscription on first flyleaf); owned by Courtoys (ca. 1680; inscription on end pastedown); Simon Brigault and Agnau Brigault (ca. 1780; inscription on end pastedown); purchased by J. Pierpont Morgan (1837-1913) from Leo S. Olschki in 1912; J.P. Morgan (1867-1943). Ms. written and illuminated in Italy between 1490 and 1500. 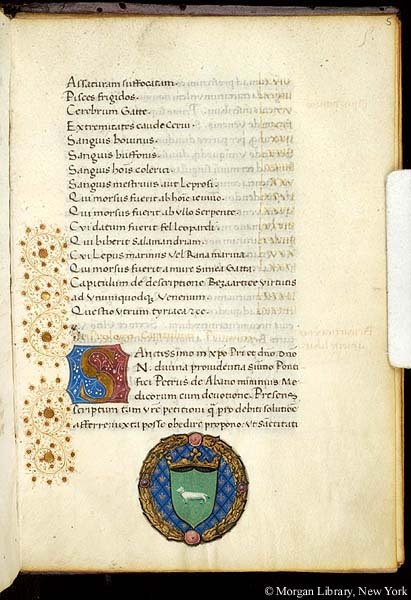 Texts: dedicatory address to Charles VIII (fol. 1-3); Petrus de Abano's De veneris (fol. 3v-33); Franciscus Pamoleus's De lapidibus (fol. 33-36v). Decoration: 2 floriated initials with marginal scrolled extenders; a coat of arms; a green shield bearing an ermine (the shield set on a blue background covered with gold fluers-de-lis in diamond compartments and surmounted by a gold crown, the whole encircled by a gold wreath).